A streetcar passes by Babasaki in the Marunouchi district in Tokyo, looking towards Yurakucho from the Imperial Palace. Because of its many red brick buildings, the street was popularly known as “Londontown.” The building on the left is the Bankers’ Club. In 1918, the Kaijo Hoken Building was erected here. On the right, part of the Metropolitan Police Board is visible. During the Tokugawa Shogunate, Marunouchi was filled with the estates of regional daimyo (powerful feudal ruler). After the Shogunate fell in 1868, their estates were appropriated by the Meiji regime. It was eventually sold to the Iwasaki family, which founded Mitsubishi. This family erected the first buildings in Marunouchi in 1894, including the Mitsubishi headquarters. 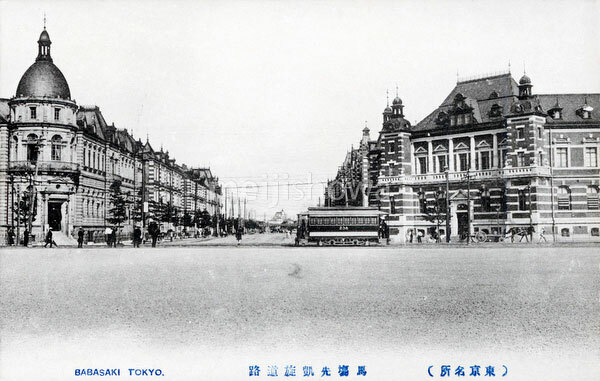 When Tokyo Station opened in 1914, right at the edge of Marunouchi, the area boomed. By 1922, more than 30% of Japan’s largest companies were located here.